I’m actually not a huge fan of hot chocolate. I mean, I completely see the appeal and I know it tastes delicious. But the idea of drinking a whole mug of it makes me a little nauseous. 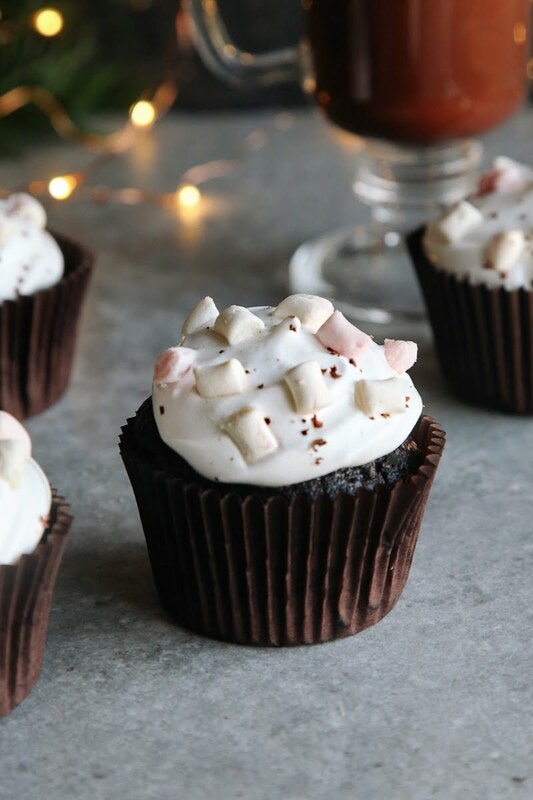 So these hot chocolate cupcakes are just the thing. 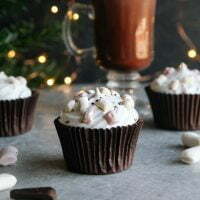 All the flavour of a comforting hot chocolate in the form of a cupcake! 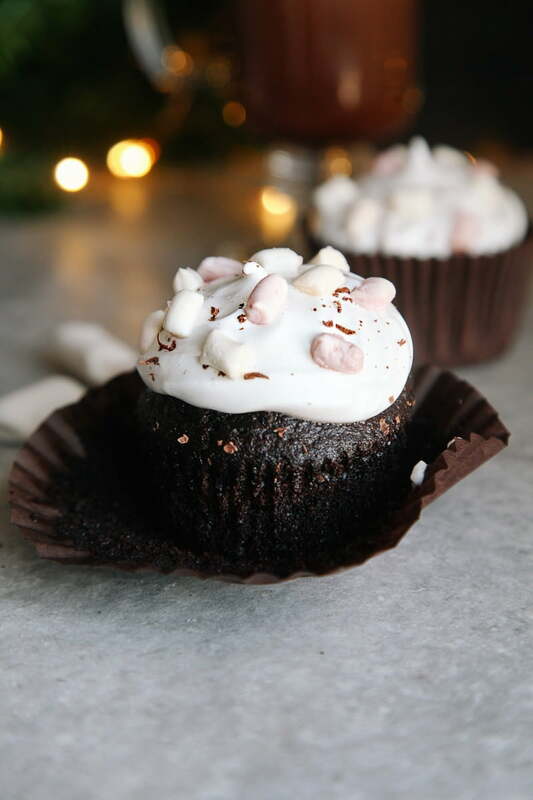 The chocolate cupcake mixture I used for this recipe is one I’ve been using for a while. It’s based off of Nigella’s ‘Dark and Sumptuous Chocolate Cake’ (Sumptuous is such a Nigella word, isn’t it?) which I’ve tinkered with slightly to create my go-to chocolate cake recipe. Side note: This recipe works very well with gluten-free flour so feel free to substitute the flour for an all purpose gluten-free flour instead. Because the mixture uses hot water, it instantly creates this warm chocolatey smell. Just like hot chocolate! Which is what gave me the inspiration for these cupcakes. The topping is made with aquafaba (aka chickpea water) and if you don’t know what that is yet, it’s water from a can of chickpeas, or other legume, which you can use as an egg white substitute. It works incredibly well! See some of my other aquafaba recipes here. I usually just use the aquafaba straight from the tin but this time I experimented to see if it made much difference to boil it down first. I’ve seen a lot of people do this. Essentially it’s just boiling down the mixture to cook off some of the water and create a more concentrated liquid. I think it definitely created a thicker, glossier mixture and it didn’t take that much extra effort so I think I will probably do this from now on! And to add to the marshmallowiness, I decorated the cupcakes with some vegan mini marshmallows. I used Freedom Mallows mini bites but you can use regular ones and chop them into smaller pieces too. Preheat the oven to 180C / 350F and line a muffin tray with 12 cases. Mix the first five ingredients together until well combined. Stir in the remaining wet ingredients until the mixture is smooth and lump-free. Divide the mixture equally between the 12 muffin cases and bake for 15 minutes. Use a cake tester or skewer to test the middle of the cupcakes come out clean. If not, bake for a further 5 minutes. Leave to cool whilst you make the frosting. Pour the liquid into a measuring jar. Mine came to about 150ml, so I aimed to boil the mixture down to about 75ml. You don't have to be exact but you want to reduce it by about half the amount. Pour the mixture into a saucepan and bring to a boil. Simmer until it looks reduced by half the amount. Transfer to a stand mixer with a balloon whisk attached (you can use an electric whisk but it might take a bit longer) and whisk until frothy. Slowly add the sugar and whisk on full speed for about 10 minutes until stiff and glossy. Add the vanilla extract in at the last minute. Transfer the mixture to a piping bag or just use a spoon to add the frosting on top of the cooled cupcakes. Top with mini marshmallows and grate a little extra chocolate on top. Enjoy! These will keep for 2-3 days in an air-tight container. I made these for the first time for a Daffodil Day bake sale at work last week. It was bit of a leap of faith as I never used aquafaba before! The chocolate muffin is an utter dream. I couldn't believe that I was able to produce something that nice! So thanks for sharing your 'go-to' chocolate cake recipe, it's definitely going to be mine now too! And I already noticed you adjusted it in the Lavender muffins to use coconut sugar. Even better! The aquafaba marshmallow creme was amazing. I couldn't believe it worked so well. Only thing I noticed; I made these in the afternoon the day before the lunch time bake sale. Not being 100% sure, I stored them in the fridge and 2 surplus ones at room temperature. I found that the Marshmallow creme on the ones in the fridge broke down a little more than the room temperature ones. Ideally I think I should have applied the creme last thing at night or early in the morning. They still looked good enough for sale though and tasted divine! Thank you so much for all your awesome recipes, I can't wait to try them all. Such a cute idea and they look amazing :D love the sound of the marshmallow frosting, yum! Hot chocolate is okay and all (although I agree on the nauseous thing), but it could never compete with a cupcake for me. NEVER. Especially when there is marshmallow frosting to be had! 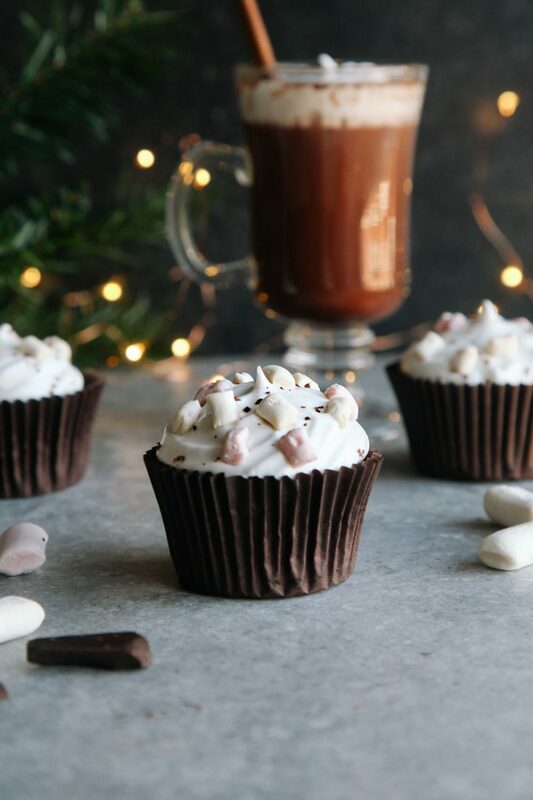 I'd much rather have a hot chocolate cupcake than a mug of actual hot chocolate, too! These look wonderful, Aimee! These look so rich and decadent!